“When did this start?” I asked, trying to begin our timeline. There are some clients that can quickly pinpoint the origination of their concerns while others struggle to nail down any event or date. Wanting to touch back on the actual issue of insomnia, I redirected, “I’m sure you probably know that insomnia, a lack of sleep, can have really dire effects on your overall health.” Cliff nodded, so I continued. “From what I’ve read, I understand it can lead to big health issues like heart disease, heart attacks and all of the symptoms that lead up to those big heart problems.” I leaned in as I rattled off the list. “It makes depression worse. It can affect almost all aspects of your health.” He sat quiet and still. He didn’t seem to register any of the symptoms. “Do you have any stress in your job?” I asked, expecting the typical reply. Most people rely on their income, there are daily interactions with others that can be negative, etcetera. Cliff’s experience was no different. There were brief pauses throughout our conversation. Cliff was very deliberate in his sharing of details and much of the time he seemed uncomfortable. “See?” He held out his obviously clammy hands. “I get sweaty and know that I’m just overtired. Last night was particularly frustrating. I woke up every half hour, checked the clock, tossed and turned, and then I’d doze off.” He became very solemn. “Sarah and I had a bad week. It seems like we don’t have many good weeks anymore.” He was obviously despondent. It was clear he had many different concerns and was struggling to untangle which ones were most problematic because they all were, and they were all connected. We had to wrap up our appointment, so I finished by sharing information on the physiology of stress on the body. Cliff nodded as he processed the information very carefully. 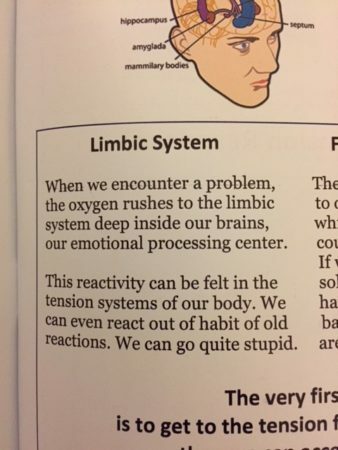 I handed him the workbook opened to the page that described the Limbic System. I asked him to take a look at it before our next appointment, and write down any questions he might have as he took it all in. The next session began quite differently for Cliff. He had read and re-read the workbook, studying the definitions, the diagrams. It was obviously a game changer. 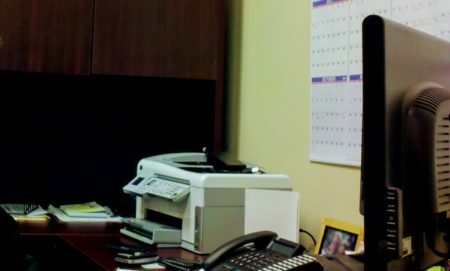 For Cliff, seeing the information in black and white, printed in front of him had a significant impact. I have shared this story as a glimpse of a coaching relationship. This story is based on multiple clients’ personal stories. *Names and details have been changed for privacy.